Could it be More Disappointing? Disappointments are not surprising when they are expected. They can be very hurtful if they were not expected especially in dire conditions. But it is worrisome when such disappointments replay time without number. Last weekend had different shades of disappointments for various teams. You cannot talk about Arsenal without Arsene Wenger. He has done so well for the club and England at large but it is becoming stale to attribute lack of trophies to the Emirates Stadium or the financial muscles by other clubs. That has been the music around Ashburton Groove for over 10 years with back to back FA Cup title in the last two seasons quenching the long taste for a trophy just like fresh spring in the Sahara desert. Success is contagious, just as failure. The painful loss to Barcelona in the 2006 UEFA Champions League final started the journey to the wilderness until the FA Cup in 2014. Back to back FA Cups looked like a spring board to the bigger price – The Premier League, and maybe the Champions League. But somehow, Arsenal bottled it up. Top at Christmas, the Gunners are hanging unto 4th spot just like every other previous years. This should not be surprised especially seeing that the board measures the teams success based on competing in the Champions League every season, raking in quids and looking relevant. The Gooners surely enjoy being in the Champions League but for how long can mere participation and qualification from the group stage be a success? The top two teams in the Premier League this season are not financed by petro-dollars or some spend-thrift but they have shown the Gunners how it can be done. Is Wenger outdated or stubborn? This season has been disappointing and it is iced by Leicester City leading the park, chased on by Tottenham – a team Arsenal has always finished above since the Wenger era. There most likely will not be a Totteringham celebration this season but who cares? The fans have been reduced to fancy rivalry with mid-table clubs instead of rubbing shoulders with the mega powers in football. In Nigeria, no one cares about Tottenham. There is more rivalry with Chelsea than with the other team in North London. When a team throws away a 2-0 lead to scrap in a 3-3 draw, you would expect them to give a better performance. The 1-1 draw on Sunday to Crystal Palace was just immeasurably disappointing. Disappointment is a mild word to be used to describe such situation. Leicester City had drawn to West Ham with Vardy blown up. Wenger had told the world how the team will continue to fight. Little did we know that he meant the 4th Placed Trophy. I wonder what Gabriel was doing with Adebayor on the line and how Cech couldn’t keep the shot from rolling in. This is almost metaphysical. With very few chance at goal, the Eagles scored. Ozil drifted and is yet to break Henry’s record – an achievement i had hoped for him. Sanchez did score but Iwobi’s run of an assist or goal in the Premier League came to an end. Giroud and Ramsey made little impact and Walcott should just refund his wages to Arsenal – negative input. He just ran into another player to sum up his 10 years for Arsenal. Whether Wenger remains or not, this season has been disappointing and could have been better. Next season, Pep will join and the kitchen will be hotter. Till Thursday again. 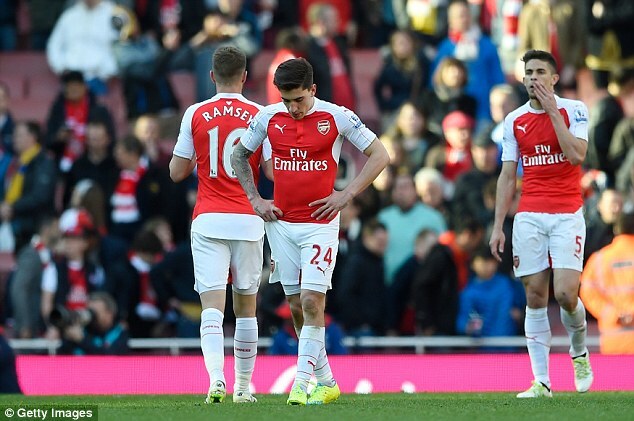 Away from Arsenal, there are other teams that are undergoing a disappointing spell. One of such team is Barcelona. Four straight losses is a form Ikorodu United will be proud of. Barcelona and Atletico Madrid are now on the same points with Real Madrid 1 point behind and 5 games to round up the season. Did Arsenal infect Barcelona in the Quarter Final of the Champions League? In the NPFL, there home wins all round the country with the only possible away win thwarted in the 74th minute after acts of hooliganism evolved in Jos. Rangers were leading 1-0 over host Giwa FC and will need to continue the game on April 27th in Abuja. Giwa FC have been fined by the LMC and one of the hoodlums was arrested. It will be recalled that Giwa FC also caused trouble in their last match of last season when they abandoned the match after going down 2-0. They were fined and the court instructed that 3 points be deducted from their accrued total but that was done by the authorities. The Jos based side needed to win that game to qualify for the CAF Confederation Cup. They are in the news this year again with their proprietor causing some problems to the NFF. Enough of this disappointments. Enyimba will play Etoile du Sahel on Wednesday night for a place in the group phase of the CAF Champions League. The Elephants have a 3-0 lead in the first leg and will hope to see off their host. The Tunisians are doing everything possible to break the morale of the Nigerians but such disappointing acts can only fuel determination on the pitch. Come On You Elephants. Time to enter the kitchen.